The Richmond Symphony offers a variety of concerts, from classical to contemporary, that will delight your entire family. Introduce your younger children to the Symphony with our Union Bank & Trust Lollipops Series. For a fun night out for the whole family, try one of the Genworth Symphony Pops concerts. 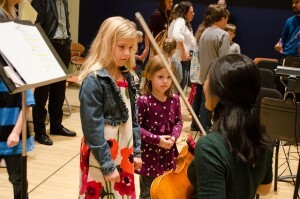 Inspire a lifelong love of music with an Altria Masterworks concert. Children’s tickets are for ages 3 to 18 and start at just $12 for most of our concerts. For our Altria Masterworks concert, receive a free child ticket with the purchase of an adult ticket. Here you will find concerts recommended just for you. Share the power of live music with your entire family! LolliPops Concerts are now Sensory-Friendly! Sorry, there are currently no events on the schedule for this category. Please check back soon or contact our ticket office for more information.